What will the relationship between US Henry Hub and European hub prices look like in a world of US exports? Prices at the UK NBP and US Henry Hub converged completely during the last global supply glut in 2009-10. This was a simple consequence of global oversupply. The sale of surplus LNG into the European gas market drove down hub prices to the point that it was more profitable to divert LNG to the US. Stepping forward to the current phase of oversupply could this happen all over again? The answer to this question is not a simple yes or no. Convergence is definitely possible as new LNG supply ramps up over the next 2 to 3 years (as we set out here). But the introduction of US exports means that it is likely to be a different sort of convergence to that experienced in 2009-10. The liquefaction cost is relatively straightforward as it is specified in most US export contracts at 115% of gas cost (~0.30 $/mmbtu with Henry Hub at 2 $/mmbtu). In some cases there may also be some incremental transport cost for getting gas to the terminal. The shipping cost is the most complex component and varies by company. First, the physical vessel characteristics (size and technology) has an important influence on costs. Second, some cost elements are truly variable (e.g. propulsion), but other elements may have sunk cost characteristics (e.g. some of the charter cost components). Third, allocation of the costs of ballast or return voyages is not straightforward. 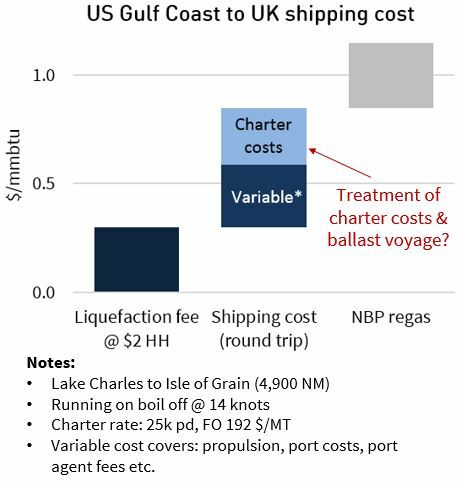 Finally, propulsion costs can be substantially reduced for longer voyages by running vessels at lower speeds on LNG boil off (e.g. 14 knots vs. 19 knots on fuel oil). We will be revisiting the complexities of shipping cost calculation dynamics in an up coming article. If the trans-Atlantic price differential really tightens, then cargoes will likely be flowed by players with access to the cheapest transport. This may mean US export contact holders selling cargoes to third parties with lower transport cost dynamics. This means the true variable cost of trans-Atlantic transport (excluding sunk costs) is likely to be the most important benchmark providing support for NBP vs HH price spreads. terminals offer easier access to liquid hubs (NBP and TTF). Chart 1 illustrates an upper and lower bound for trans-Atlantic LNG costs. A lower cost bound of about 0.6 $/mmbtu comes from assuming all charter and regas costs are sunk and the maximum benefit is gained using boil-off to reduce fuel costs. This can be contrasted with an upper bound of around 1.15 $/mmbtu if all variable cost elements are included. Spot prices at North West European hubs are currently around the 4.10 $/mmbtu level. Spot US gas prices at Henry Hub (HH) are close to 2.10 $/mmbtu. This 2.00 $/mmbtu NBP vs HH differential is relatively stable across the forward curve horizon as shown in Chart 2. As oversupply in the global LNG market increases over the next two years, this US vs European price differential may narrow. But in a world of US exports the variable cost of trans-Atlantic arbitrage becomes a powerful force working to maintain a positive trans-Atlantic price spread. 35 bcma of US export capacity is due to come online by the end of 2018. This is set to swell to around 80 bcma by the end of the decade. US exports of this scale provide an important support mechanism for both global gas prices and the trans-Atlantic price spread. If NBP vs HH price differentials fall below the variable cost of moving gas from US to European hubs, then US exports will be ‘shut in’. This acts to support trans-Atlantic price differentials in two ways. Firstly it reduces global LNG supply, supporting European hub prices. Secondly the shut in of US gas increases supply at Henry Hub, putting pressure on US gas prices. As US exports ramp up, the factors described above will act to increase the influence of Henry Hub on European hub prices. 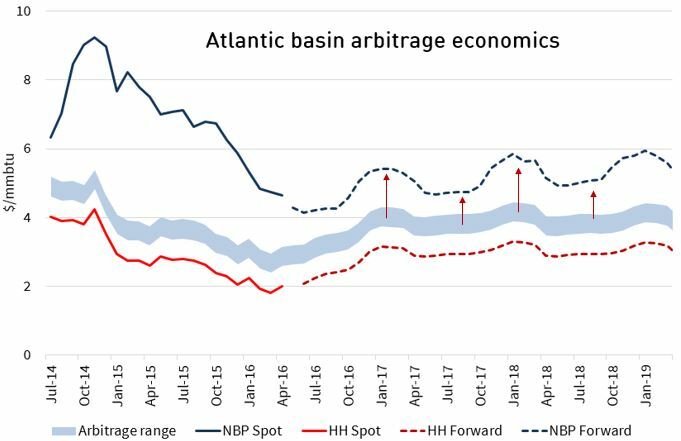 It will also strengthen the Atlantic Basin price signal as the main driver of global LNG pricing. This means it is important to start to look to the east. Henry Hub prices are going to feature more strongly in European gas portfolio exposures, whether explicitly or implicitly. And this is an important consideration for portfolio management and development. Timera Energy is presenting at Flame this week. Olly Spinks is speaking today on the impact of US exports on European hub prices. David Stokes is speaking on Tuesday on European hub price dynamics and gas portfolio exposures.